I love waffles! And last Saturday I actually got up early enough to make a proper weekend breakfast! 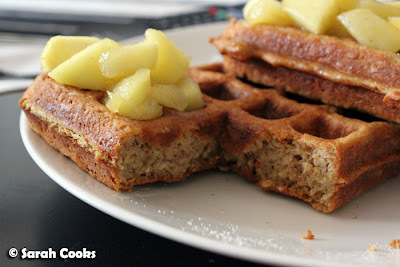 I've been craving waffles since I read this post about oatmeal waffles on the lovely Sophia's blog. 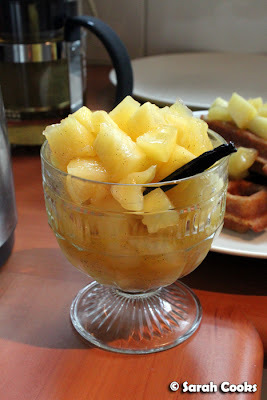 Actually, let me correct myself - I constantly crave waffles, but after reading Sophia's post, I was craving oatmeal waffles! Hehehe. The waffle recipe comes from allrecipes.com, and differs from a plain waffle dough in that it contains quick oats (I just whizzed some normal oats in the food processor), cinnamon and a bit of brown sugar. Sophia served hers with blueberry flavoured maple syrup, but I was in the mood for something a bit fancier, so I sautéed some apple pieces in butter with some castor sugar and a scraped vanilla pod. (Inspired by Nigella's recipe for sauteed apples with sweetheart croutes, from Nigella Express). 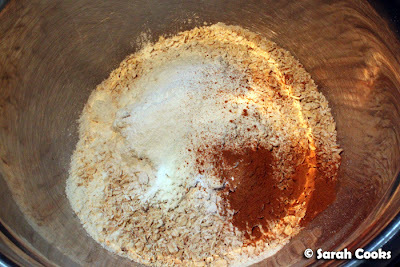 It also helped me to use up the 2 apples that had been sitting, unloved, on the kitchen counter for a good week. Oops. The dough was perfect for my waffle iron - yay. You may remember that my waffle iron has deeper ridges than a normal one, and I've found that my standard Roux Brothers waffle recipe tends to leak out the side, rather than rising and filling the iron. I once made plain waffles using the recipe from the instruction booklet, but they were way too doughy (and this is coming from a girl who LOVES dough and stodge!) This recipe, however, was perfect. The dough spread and rose to fill the waffle iron completely, without leaking - making beautifully square waffles with crispy edges. 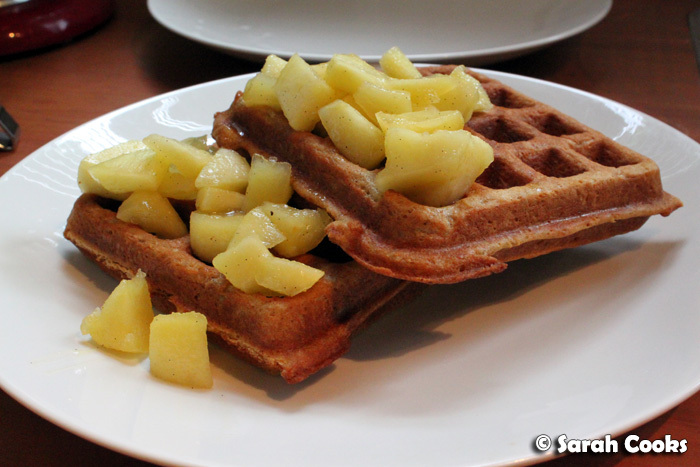 I loved the wholesomness of the waffles, with their toothsome oaty pieces and cinnamon aroma. A word of warning though - these waffles are very substantial, and just one waffle makes a big, filling breakfast.